I've never been one for sports. I watch Major League Baseball from time to time. But as far as other sports, I just never got into them. March is an exciting time for a lot of sports fans, as the March Madness gets underway for college basketball. But for wrestling fans, March Madness means something entirely different. March or early April is when Wrestlemania takes the world by storm. My partner in crime, Chad and I will attend our sixth Wrestlemania this year as we head to Miami later this month. 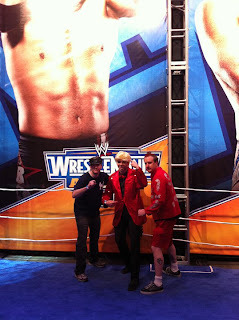 And I know we criticize the WWE a lot, but heading to Wrestlemania each year is a personal highlight for me. Of course, I enjoy watching it on PPV as well, but there's something about being there. Even when the card is less than desirable, there's an electricity and an excitement in the air that can't be replicated. So this month, I've decided to write about some of my favorite Wrestlemania moments. Look for "Mania Memories" all month long. I've asked Chad to contribute, and I want to hear from you too. Feel free to make comments here on the blog or on our Facebook page. Thanks again for reading and watching My 1-2-3 Cents on YouTube.